My favourite Winnipeg winter days are crisp and bright: the snow is fresh and crunchy underfoot, the trees draw sharp profiles against a cloudless blue sky overhead. Seeing the bright white and blue landscape makes me feel like I'm sitting in front of a blank piece of paper; it is a time to reflect, time to anticipate, time to simply be. However, these sunny days are also the coldest, and all I have to say about that is to echo what a wise Alaskan once told me: "There is no bad weather, only bad clothes." Enough said. 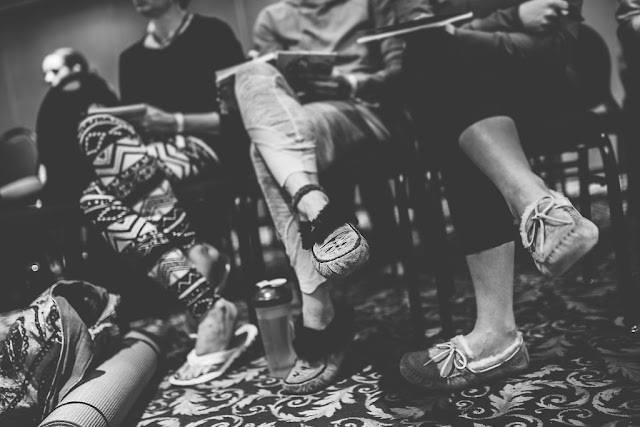 To best enjoy this time of year, it is important to take care of one's body, mind and spirit. Ayurveda (the traditional healing method originating in India) advises that in winter, we nourish ourselves with warm and cooked foods, bundle up properly, and spend time with our loved ones. 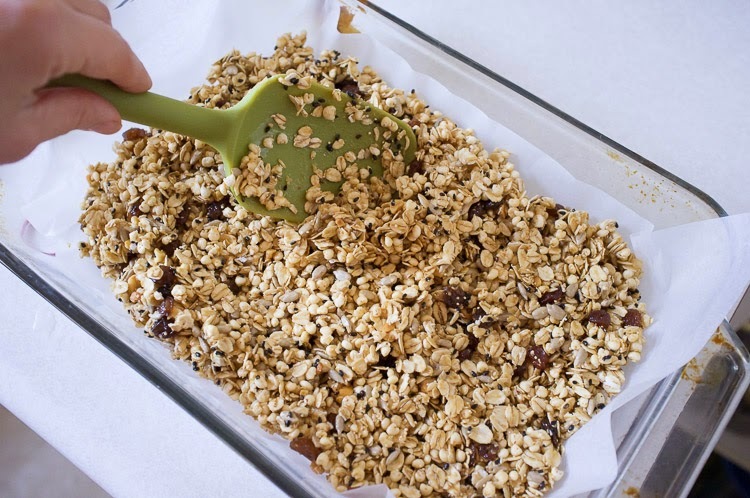 So invite some friends over for breakfast, and make this granola bar recipe together! Better yet, make a little extra to stuff in your pockets and enjoy during a walk on the frozen river. 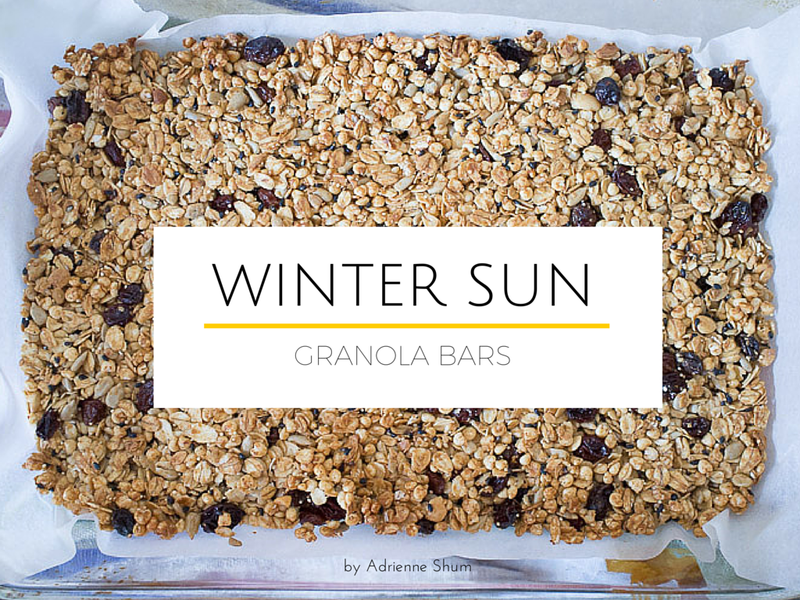 While there are endless variations and replacements to be made in a granola bar recipe, the following choices were settled upon due to Ayurvedic principles that suggest we eat according to the seasons. 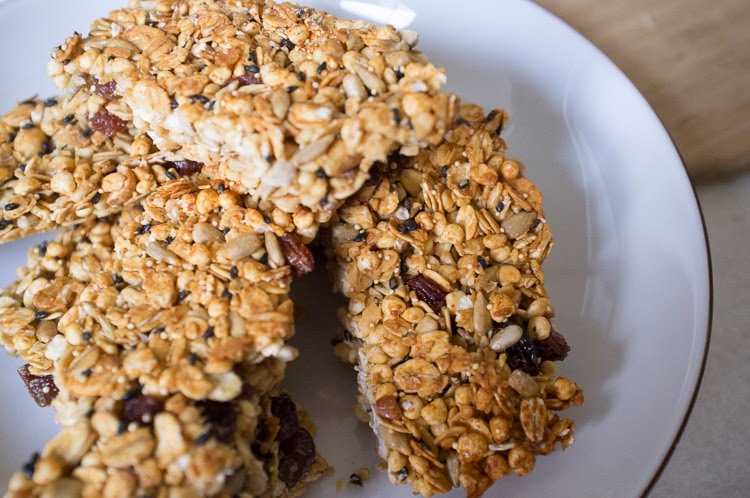 We will be serving these granola bars at the Om Nom Nourish workshop on Saturday February 7th, but in the meantime, try them out for yourself! This recipe uses sunflower seeds and sunflower butter, which were obvious choices due to their very punny attributes (sun!). Moreover, sunflower seeds are very nourishing and good for all the Doshas. Black sesame seeds were included as they contain high amounts of solar energy (which we could all use more of during short winter days), and like sunflower seeds, are very rejuvenating. Millet and amaranth are gluten-free ancient grains that are high in protein and fibre, and along with oats, they are calming and strengthening foods that can soothe the winter blues away. Both raisins and cinnamon improve digestion, and cinnamon helps to warm the body - a very welcome attribute in winter. Brown rice syrup and maple syrup have relatively low glycemic indexes (meaning they do not cause huge spikes in blood sugar levels compared to other sweeteners), and more importantly, having a little sweetness in your diet will make you a little sweeter (wink!). 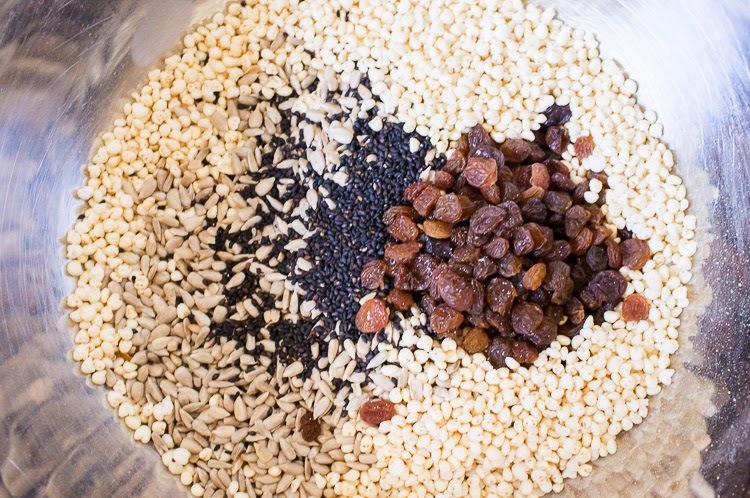 In a large bowl, combine all the dry ingredients. Meanwhile, in a small pot, gently heat the syrups and seed butter, stirring with a spatula. When it has warmed and loosened up, pour it over the dry ingredients and mix well to combine. The mixture will be very sticky. Scrape it all into a 9x12" baking pan that has been lined with parchment paper. Spread it out evenly and with slightly wet fingers or a rolling pin, smoosh the mixture down so it is well packed (this will help it stick together). Bake in a preheated 300 F oven for 20 minutes, until the top is golden brown. Let it cool completely before cutting. There is also the option to not bake the bars and stick the mixture into the freezer to firm up! A short visit of 10 minutes in the freezer should do, and then the bars can be cut. I prefer the toasty flavour of the baked version, and cooked foods are more appropriate for this time of year - plus, turning the oven on in the winter makes the house warm and cozy, which is an added bonus. 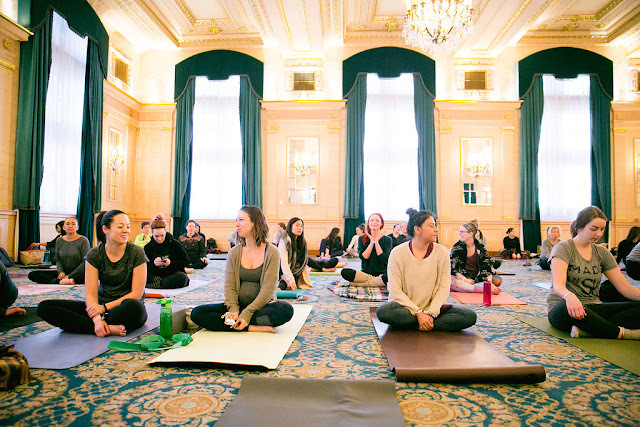 Adrienne Shum is an Ayurvedic counsellor and yoga instructor in Winnipeg, Manitoba. When she isn't practising and teaching yoga and Kirtan, she is usually found in her kitchen making something good to eat. 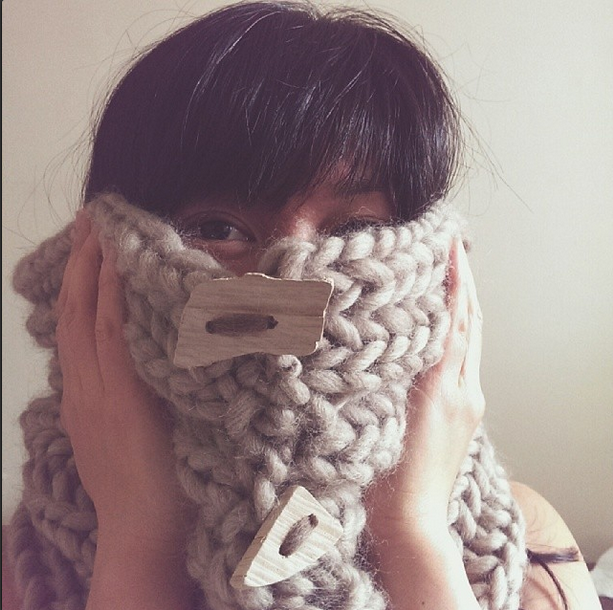 To find out more about Adrienne, please visit: www.adrienneshum.com.